Every week we try to have a special family movie night, and have had this tradition since the kids were born! This week we received a special box in the mail from our friends at Universal Pictures Home Entertainment. 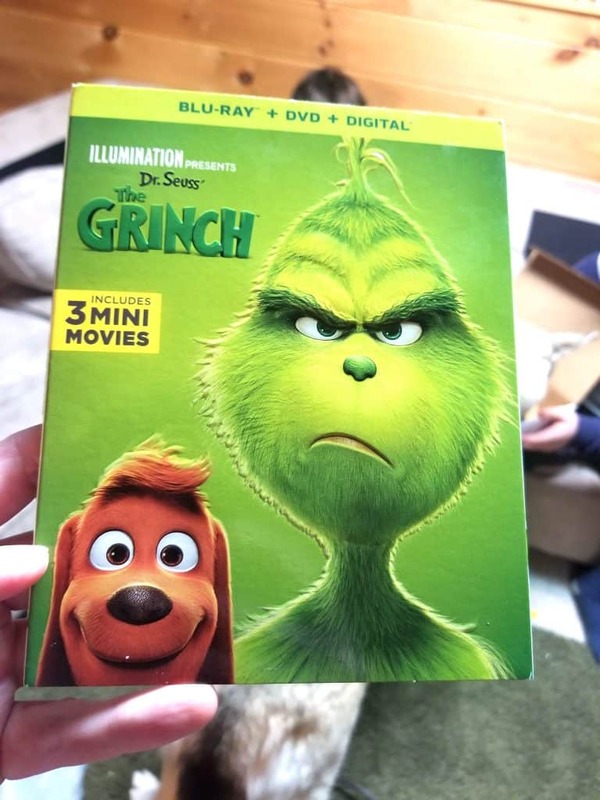 Inside was the NEW Dr. Seuss’ The Grinch movie! It is available on digital January 22nd and on 4K Ultra HD, 3D Blu-ray, Blu-ray and DVD February 5th! Below are some crafts, activities, recipes, and BONUS FEATURES details on the new Blu-ray! 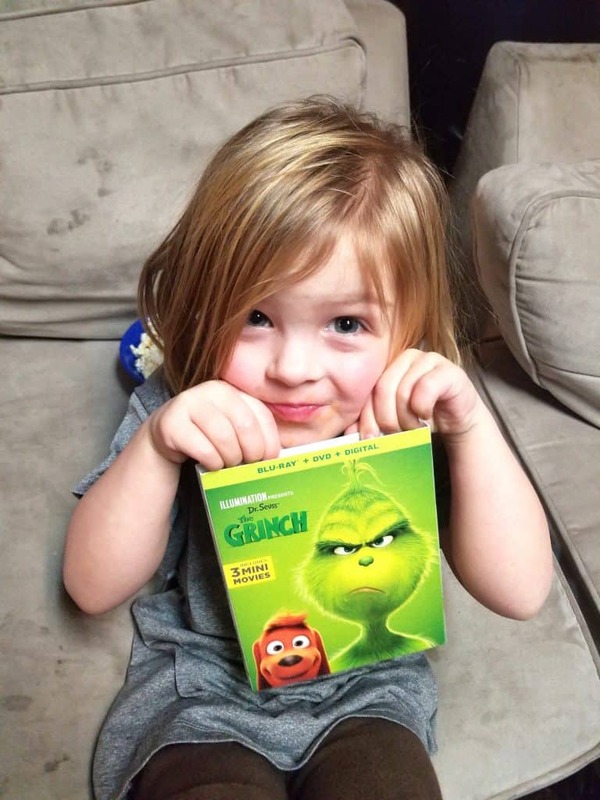 We didn’t get the chance to watch this movie in theaters so all 5 of us were pretty psyched to watch The Grinch at home!! It is SO CUTE and by far my favorite Grinch story yet! Order The Grinch on Blu-ray / DVD right now! 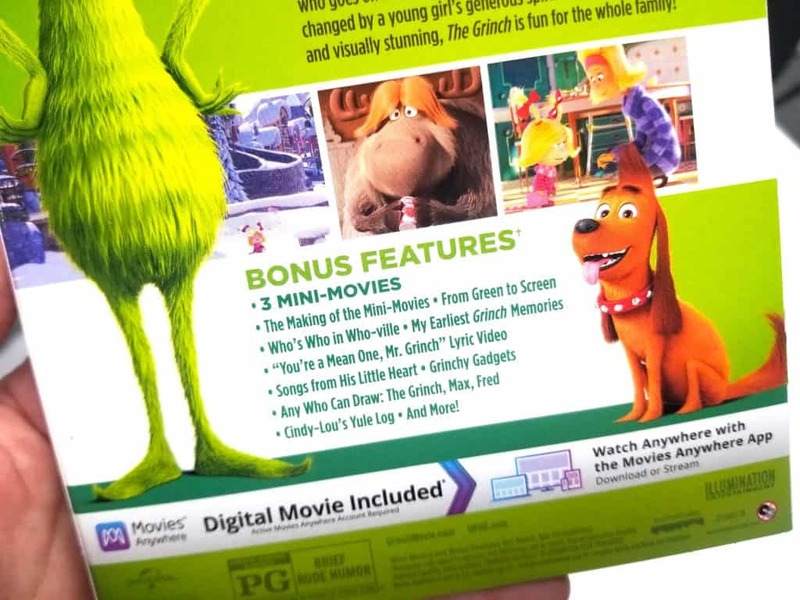 The Grinch on Blu-ray / DVD / Digital comes with 60 minutes of bonus content!! Included are three hilarious new mini-movies featuring the Minions and Max! In fact there is even a “how to draw” session that kids will love! My kids really enjoyed all of the extra bonus content! Narrated by Grammy Award®winner and Oscar® nominee Pharrell Williams, Dr. Seuss’ The Grinch stars Academy Award® nominee Benedict Cumberbatch (Dr. Strange, “Sherlock”) as the infamous Grinch, who lives a solitary life inside a cave on Mt. Crumpit with only his loyal dog, Max, for company. The incredible voice cast includes Rashida Jones (“Parks and Recreation,” The Muppets) as Donna Who, Kenan Thompson (“Saturday Night Live”) as Bricklebaum, Cameron Seely (The Greatest Showman) as Cindy-Lou Who, and featuring legendary actress Angela Lansbury (Anastasia, Beauty and the Beast) as the mayor of Whoville. If you’re looking for an awesome family Valentine’s Day gift this would be a perfect surprise! 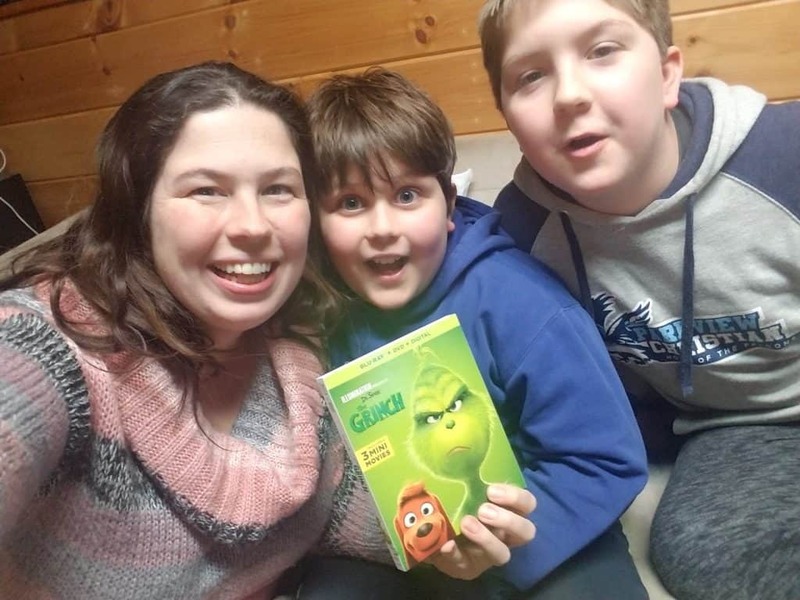 Check out inspired by Grinch crafts and recipes below that you can do for a fantastic movie night surprise! Or you can find our other Dr. Seuss related activities here! Want to win this awesome prize pack? Leave a comment below letting me know who your favorite character is in The Grinch!!! Giveaway ends January 31, 2019 at midnight CST. 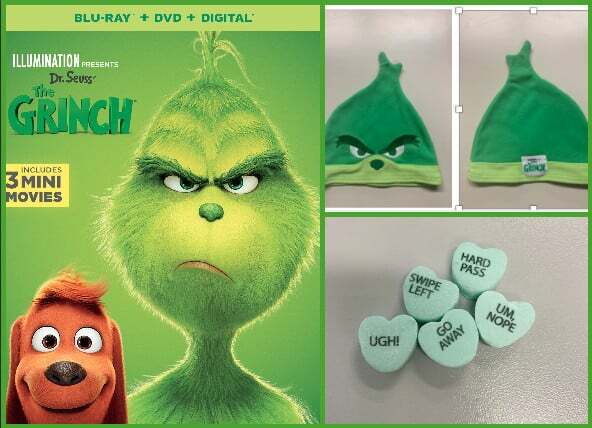 Included in this Prize Pack is The Grinch Blu-ray, a Grinch beanie, and Grinch Valentine’s Day Candy Conversation Hearts! **Open to contiguous USA Address only. Prize(s) shipped and responsible for by sponsor. Winner will have 48 hours to respond to e-mail before a new winner is chosen. FREE Wonder Park STEM Educator’s Guide, Poster & Activities 25 Good Kid-Friendly Podcasts for Kids to Learn Something From NEW Disney Fancy Nancy Disney Junior DVD Available! Disney Artemis Fowl Movie Trailer + Insider Access & Sneak Peeks Perfectly Bookish -Best Unique Gifts for Book Lovers DreamWorks Trolls Toys Unboxing Mystery Box + Season 4 on Netflix The Magical World of Books Come Alive at Universal Studios Conservation & STEM Technology in Disney Theme Parks Entertainment Goosebumps 2 Movie: Haunted Halloween Movie Trailer, Date, Poster NEW R.L. Stine HorrorTown Goosebumps App to Download! Secrets of Pixar: Making Baby Jack Jack and His Powers Incredibles 2 Incredibles 2 Movie Fun Facts, Insider Access and Exclusive Film Details Disney Pixar Short Film Bao: Meet the first Female Director at Pixar Disney’s DuckTales: Destination Adventure! on DVD Review Incredibles 2 Press Conference: Q&A with Movie Director and Producers How Did They Create Pixar Incredibles 2 Movie and Action Scenes Art, Math & Technology Behind Pixar Animation Studios Costumes Tips for Hosting a Magical Garden Tea Party for Kids Disney / Pixar Exclusive Insider Access to the Incredibles 2 Movie 2018 Movie Film Slate – AWESOME Movies Coming Out This Year! The Grinch! I love how he turns good! This would be perfect for my Dr Seuss room! Thanks for the chance to win! The Grinch is my favorite character. I always read and show the video of the Grinch every year to my students. This would be a great addition to my collection and the kids would love it. Would love to win this giveaway. My favorite character is Cindy Lou. I love her heart ❤️. I really enjoyed the movie and all of the characters in it, but the Grinch would be my favorite. I like Cindy Lou Who. Max! He’s so loving to his master , sticking by his side. Max is my favorite!! Love his dedication and loyalty!! ???? Max is my favorite, of course!!! Figers crossed for a big win!! I loved Fred, the yak looking reindeer. He was hilarious and so cute!!! I loved Fred, the yak looking reindeer. He was HILARIOUS and so cute!! My heart would grow three sizes if I won.